Thankfully, living next to rubbish neighbors can have hilarious consequences. I guess in a lot of cases, residential areas can include a real mixture of personalities and there’s no way of avoiding that. Well, unless you’re super rich or live out in the middle of nowhere. Some homeowners are extremely high maintenance and take great pride in the appearance of every blade of grass on their front lawn. Others aren’t really fussed and allow their dogs to continually poop on theirs until all of the dog feces pile up and merge to become one giant super turd. Ok, I’m exaggerating slightly here but some people really don’t care about the little things in the same way. Check out this brilliant list of neighbors getting their messages across in the most passive-aggressive ways ever! This guy’s neighbor had made negative comments about his sexual preferences. 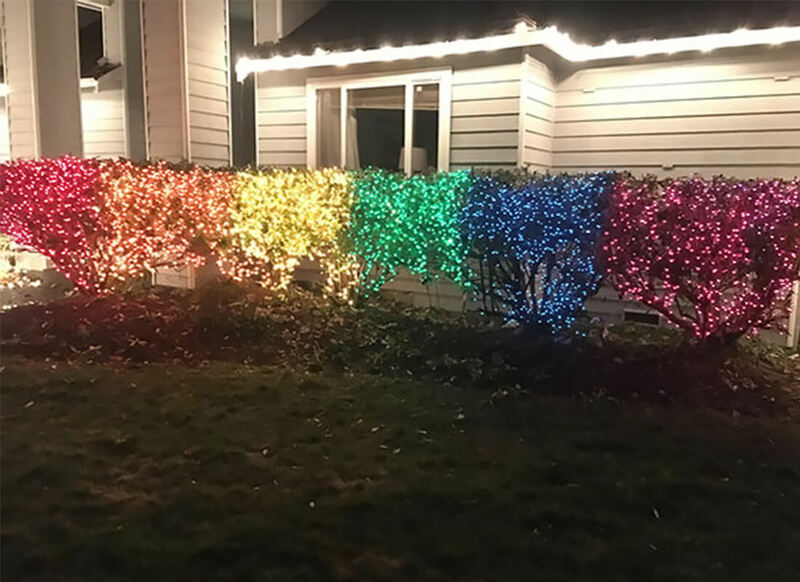 So, rather than use physical or verbal aggression as a response, he chose to use thousands of lights displayed across the front of his house instead. Love it!